Sansho Living is proud to showcase unique and beautiful Japanese ceramics and homeware, including flower vases, fruit bowls and lampshades all suitable for everyday, western lifestyle. On Thursday, 6th June 2019, Sansho Living will lead a seminar The Beauty of Imperfection to introduce the participants to the philosophy of traditional Japanese aesthetics wabi-sabi, which promotes the acceptance of transience and imperfection. 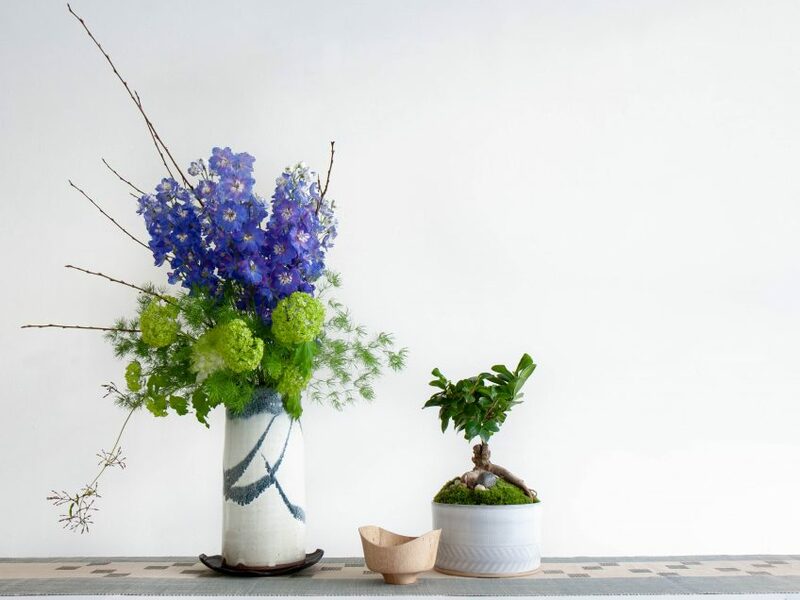 The head florist at Aoyama Flower Market will guide the Flower Arranging and Bonkei Classes, on four different dates, at Sway Gallery London. Sansho Living works with craftsmen and creators all across Japan to make the homeware which is both functional and beautiful. These products combine the Japanese tradition with the modern approach, resulting in the tactile and special products, like tableware, convenient for everyday use. The variety of products includes not only pottery, but also rattan interiors, lampshades made of Japanese paper, cushions and other soft interiors. Aoyama Flower Market was established in 1989 in the exclusive Aoyama district of Tokyo, and has opened the 100th store in Japan in 2018. After opening the first overseas shop in 2015 in Paris, they have also opened their shop in the centre of London, in Selfridges. The head florist at Aoyama Flower Market will demonstrate the art ofcombining the aspects of Japanese flower arrangement and ikebana, like the naturalistic elements and asymmetry, with a more traditional European style of bouquet to create elegant and interesting arrangements. Nature will be brought indoors, by using common, seasonal plants and branches along with flowers to celebrate the natural beauty all around us. During the Bonkei class, the participants will be shown how to construct a miniature Bonkei garden, with just moss, stones and trees. Any container can be transformed into a beautiful temporary garden which will bring peace and greenery to any house. These 1 hour long classes will guide throughout the whole flower arrangement process with ample opportunities to ask questions.